The STATCOM program is a community service program directed by and staffed by graduate students in the department. They offer professional consulting services to governmental and non-profit groups in the local community free of charge. Potential clients include schools, local government agencies, health centers, advocacy groups, libraries, adult learning centers, and other agencies and organizations. 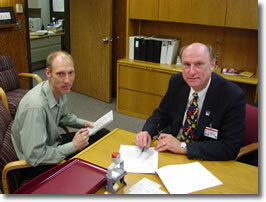 In this picture from 2004, Nels Grevstad, Purdue Statistics alumnus and founder of STATCOM, worked with the Lafayette School Corporation to analyze state funding data. The Department of Statistics has participated in Purdue's Technical Assistance Program (TAP), a statewide program that provides technical assistance to Indiana businesses and agencies. The Department of Statistics has been involved in over 100 projects in the last five years. Below are summaries of a few some past projects. Please contact TAP for more information. Regina Becker (left), former manager of the Statistical Consulting Service and Pang Du (right), Department of Statistics Ph.D. graduate student along with Steve Zeller, Perdue Farms, Inc., plant manager, and Sara Hamdan, high performance work team coordinator, pinpoint ways that Perdue Farms, Inc. could save money. As the processor of 17,000 tom turkeys a day, Perdue Farms, Inc. is an authority in grinding turkey. But when it came to reducing the average amount of meat that was being inserted into its one-pound packages, the company asked TAP for some statistical expertise. "Our net weight ground turkey is one pound," says Steve Zeller, plant manager for the facility, which is the company's sole turkey producer. "Anything above that one pound is giveaway - the customer gets it for free." The facility's machines, however, were turning out packages as high as 1.12 pounds, significantly affecting profits. Regina Becker placed the data in a bell curve, which indicated that the packaged meats were averaging 1.06 pounds. 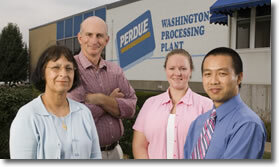 Those figures prompted Perdue staff to make small machinery adjustments. Ultimately, the facility decreased its average to 1.03 pounds, a quarter-million dollar annual savings. 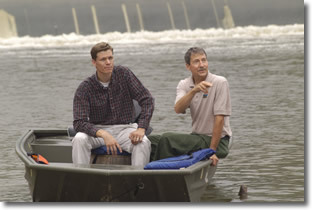 In the picture to the right, Craig Johnson, Purdue Statistics graduate student and TAP consultant, is seen with Robert Ball, Fisheries Research Biologist of the Indiana Department of Natural Resources, Division of Fish and Wildlife. Craig Johnson, Kyle Harrison, a Purdue Statistics Master's student, and Regina Becker, former manager of Statistical Consulting Service, helped Robert Ball determine the most cost effective means of conducting a user-count on the Wabash River. They examined data gathered in a previous study, and made recommendations on the validity of taking counts by air and other procedures used in the study. With their help, Robert Ball determined that user counts by air were not worth the expense, saving the division a considerable amount of money. Regina Becker, former manager of the Statistical Consulting Service along with Purdue Statistics graduate students, Nels Grevstad and Ryan Wiegand, spent a whole day meeting and touring the production lines with Jeff Wigington and the entire management team of American Window and Glass, Inc., Evansville, a fabricator of vinyl window and door products for the residential market. The rapid growth of vinyl windows in the residential market has increased the need for competitiveness and efficiency in the production process. Recommendations made by Regina and her staff for one line alone are expected to save at least 25 percent in the manufacture of one part. Within the next year, the company expects to cut losses by five to fifteen percent. 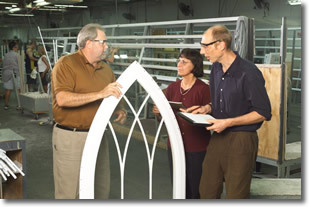 Pictured in the photo from left to right are Jeff Wigington, American Window and Glass, Inc., Regina Becker, former manager, Statistical Consulting Service, and Nels Grevstad, Purdue Statistics graduate student.